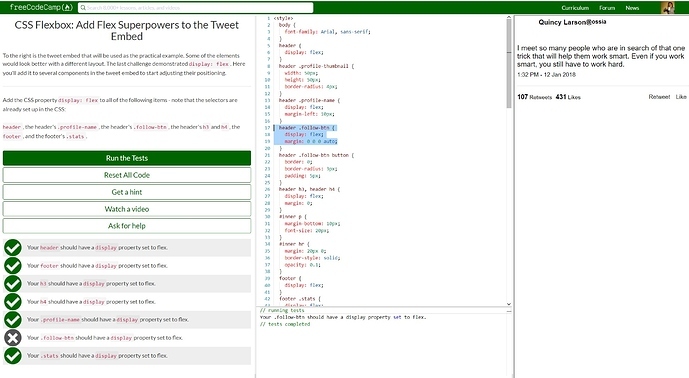 Having an issue with CSS Flexbox: Add Flex Superpowers To The Tweet Embed lesson. I’m pretty sure my code is correct. Here’s a screenshot, I’ve highlighted the section of code. If you think you’ve done the challenge correctly, simply reset your code and try again! I don’t see a reason why the test wouldn’t pass, but the reset all code feature is sometimes a nice way to go! if you have ad blockers in your browser you will not be able to pass many portions of the flexbox section due to the tweet embeds. the tell is i can’t see any of the images on the quincy larson tweet.